A number of my followers have asked me to share my recipe for Baobab Dukkah. As I recently wrote a commissioned piece on baobab trees for Royal Chundu Lodge, I thought I would combine the two. In the Kalahari desert I used to work near Chapman’s Baobab, which was said, back then, to be the third largest tree in Africa. Its time-worn canopy not only provided cover for nomad tribes and 19th century explorers, its twenty-five-metre-round trunk was used as a post office and depot for traders and travellers moving in and out of the interior. Chapman’s Baobab was a significant tourist attraction until three years ago when it collapsed and died. Chapman’s baobab, before it collapsed and died. The baobab tree is sacrosanct to the people of southern Africa. It is treasured for its longevity and its ability to survive long periods without water. The tree is also prized for its usefulness: its hollowed trunk is used for shelter or burial; its fibrous bark used for cords, cloth and fishnets; its leaves eaten as a vegetable relish; its seeds a source for vegetable oil. Traditional tools for sifting the baobab powder from the seeds. But its fruit! Contained in a velvet-skinned pod the size of a lady’s clutch bag, powder-dusted seeds are held together like pieces of a puzzle in a netting of coral pink fibre. Its fragrant powder has the texture of sherbet and is tart, like a lemon. It has six times the number of antioxidants found in blueberries, six times the amount of Vitamin C in an orange, and six times the amount of potassium in a banana. Its status as a “super fruit” has grown in recent years, especially in Europe after it was approved as a food ingredient in 2008, and then in the United States the following year. I am wary of the global hoorah surrounding the commercialisation of baobab powder. Here, we support sustainable harvesting of the fruit because it is a finite resource. We use it in some of our dishes at the lodge, but more importantly, the positive impact it has on the health of marginalised rural communities, where fresh food is often unaffordable or scarce, is critical. The trees also sustain myriad critters—elephants, baboons, monkeys, birds, bees, and much more—that live in, or off, its largesse. 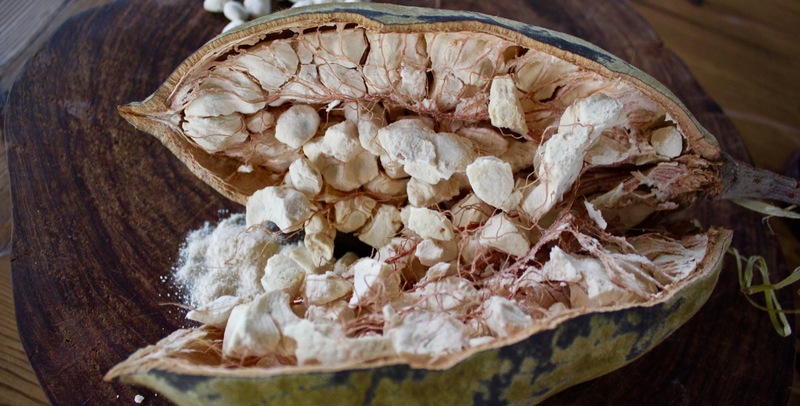 Traditionally, at least here in Livingstone, baobab fruit powder hasn’t really been used in anything other than drinks or porridge. For me, its puckering acidity adds real depth to baked goods and condiments. It’s a terrific flavour enhancer. I use it as a substitute for sour dried ingredients unavailable in Zambia, like sumac, and have paired it with fragrant flower waters to elevate their delicacy, as in these Baobab & Rosewater Elephant Cookies illustrated below. Royal Chundu’s Island Lodge is cloistered among a forest of old baobab trees. They reveal the age of this island, and for now, appear healthy and robust. The trees exist, it seems, in their own fertile microclimate created by the proximity to the Zambezi River. These baobabs, so vital to life on the island, are venerated by the staff and surrounding communities. It is Royal Chundu’s priority, therefore, to ensure that these mystical, time-honoured trees are conserved and protected. We sometimes harvest fruit from this baobab tree near our farm. Notes: By placing the nuts, seeds and spices over heat you are releasing the flavour, not cooking them. Please remember it is very easy to burn them when dry-roasting, so watch carefully. If it happens, turn down the heat, clean the pan and start again. Baobab Dukkah on top of a beetroot dip. Place a heavy-based frying pan over medium heat and leave for a couple of minutes to heat up. Pour in the fennel seeds and dry-roast them for 30 seconds, being very careful not to burn them. Add the cumin seeds and cook for another 30 seconds, or until they start to pop, then transfer to a small bowl and set aside. Put the pan back on the heat and roast the peppercorns until they start to pop, about 30 seconds, and again, transfer to the bowl. Then dry-roast the coriander seeds for up to a minute, until they start to pop, and also add to the bowl. Reduce the heat to low and cook the sunflower and sesame seeds together, tossing regularly, until the seeds turn golden. Remove from the pan, cool, and add to the bowl. Next, dry roast the mongongo nuts and hazelnuts, using the same pan. Remove and cool on a plate. Transfer to a blender, along with all the seeds, and pulse in a blender. Do not over-process. Remove into a medium bowl, and mix in the baobab powder, salt and paprika, making sure the flavours are combined well. Sprinkle on top of hummus/roasted vegetables/salads/dips, and store the remainder in the refrigerator in an airtight container.